The first image we see is The Uncle Sam Range (1876) Which is an advertising image, by Schumacher and Ettlinger, it was from New York. The objective of this image is to advertise, using America as a selling point, this is because: The image itself contains some iconography of America, the first of which would be the decoration around the room, which is very impactful, bright recognizable colours, the red, the white and the blue, these being the colours of the American flag. An addition to this, we see the bald eagle, which is another symbol of America. Secondly, in the upper left of the image, we see a clock, with the hands pointing at twelve and six, however, the clock does not read twelve and six, the clocks read 1876 and 1776, 1776 being the year which the declaration of independence was signed, 1876, the year this image was created, and the year on the twelve position on the clock is 100 years after the previous event, a celebration, which is the selling point. The image also shows us a personification of the world, using a globe with arm legs and a face, over Africa, holding a list, listing countries of the world, and they stereotypical eating habits. 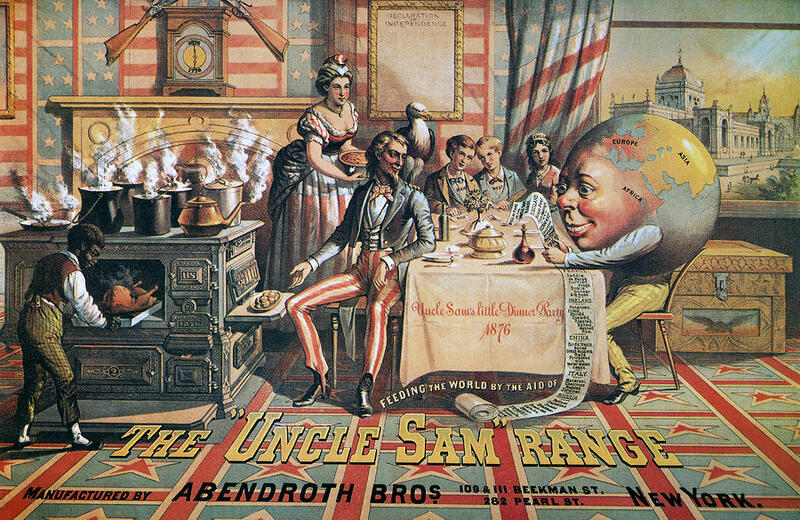 Who is sat at a table, with Uncle Sam, the personification of America, on the right of the table. The tablecloth has “Uncle Sam’s Little Dinner Party” written on the side. So, from this you could argue that the image is about inviting the world to dinner, showing their greatness, in the form of the ovens, with 100 years of independence. The second image, a poster by Savile Lumley, 1915, is a mid-world war one propaganda-style recruitment poster. The image itself, is set post-war, as we can see the man in the arm chair, hand on chin, almost recounting memories of the war in his head, however, his eyes are looking out at you, not only to grab your attention, but to relate the image to you. 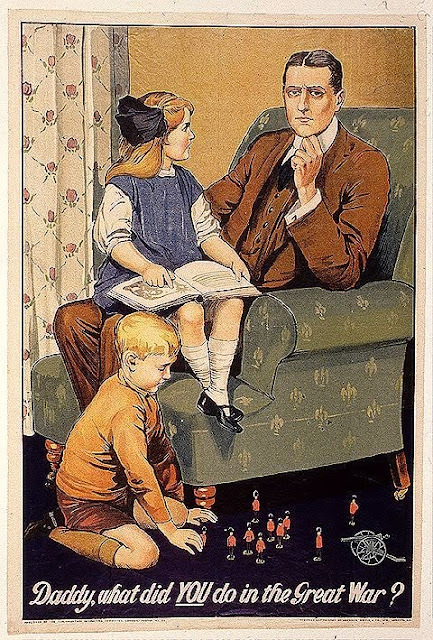 The text at the bottom of the page exclaims the following; “Daddy, what did you do in the Great War?” The first link I can make with this picture and the previous image would be the post-war almost reflective-celebration, we have. The nationalism “inviting the world to dinner” and in this one, the happy family scene, reflecting on the war. However, the obvious difference is the previous image was to advertise a product, using nationalist as a promotional tactic, whereas the second image is recruitment advertisement. A second link that can be made between this image and the previous would be that the images are both quite nationalistic, the first image is very bold and in-your –face, however the second image is quite subtle, for example, we see the royal lily pattern on the curtains and on the chair, we also see that the son, in the bottom right, is playing with soldiers, not normal soldiers, but that which you would see at the palace, who guard the royal family, and patrol the grounds. The target audiences for both pictures would also be men, as the central characters of both the images are men, Uncle Sam and the assumed War Veteran. In the first image, we also see a woman serving him, with a black boy cooking, which was considered a status symbol, the second image depicts the family life, which at the time you’d assume was an ideal.